Coaster are coming down fast at the old Freestyle Music Park / Hard Rock Park. Cranes are currently working on the removal of several of the coaster and the iconic Guitar has been removed as well. 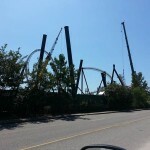 Screamscape is also reporting that many of the themed structures in the park have been coming down as well.